Thanks for posting this. I knew the instrument was in Chicago for a while but I didn't know how the story ended. Yaye, beautiful music is leaving the F-holes once again! I don't have time to watch full video, will she be playing Vieuxtemps music? Laurie please let me know if you need Vieuxtemps help, I have his complete works...just finished my collection last week!! I’m starting to think this is all a publicity stunt by Anne Meyers. 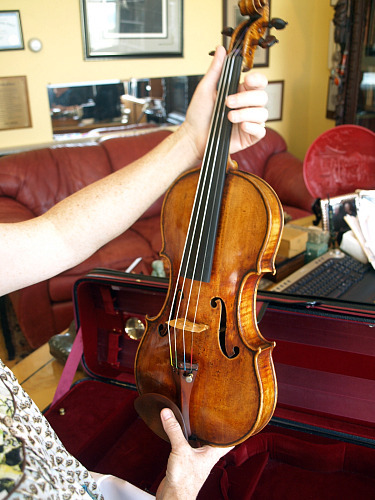 I was told by a reliable source that she has a rich funder who purchased the Molitor strad for her. And now this Guarneri del Gesu too ?? If I was a private collector who owned the Vieuxtemps Guarneri del Gesu. Anne Meyers would NOT be the first artist that comes to my mind. "If I was a private collector who owned the Vieuxtemps Guarneri del Gesu. Anne Meyers would NOT be the first artist that comes to my mind." I thought somehow in the same direction. Luckily this is maybe the most expensive but certainly not the "only one" or "best" violin out there. I am sure most great virtuosos would prefer their own instruments over the vieuxtemps. I think its sound is quite strange in the recording. Not actually something I would suspect. The best sound I heard from a violinist live so far was Gidon Kremer. It was unbelievable subtle and carrying sound. I never heard that kind of sound before and after. I wonder if he was using his Amati (Wikipedia sais so). So now we are talking about a 1980 recording by Gidon Kremer? That's fine, and we can also debate and discuss the sound of an Amati vs. a del Gesu. But I find the big jealous cat claws unattractive. This was a violin that was literally being kept under someone's bed, not really played, for many many years. As a violinist, I'm happy to see the instrument in the hands of a fine player. Exactly, Ms. Niles. We have no reason to have a grudge against Ms. Akiko-Meyers because the violin was lent to her. It's getting played, and will be heard by many. What's not to like about the news? 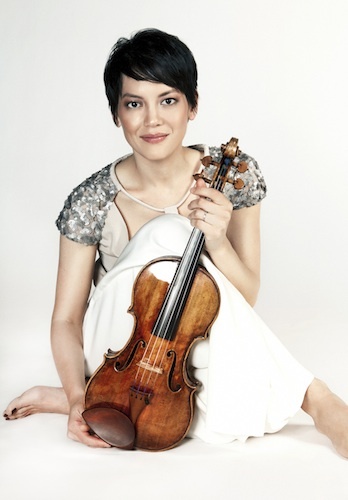 Most great soloists have their amazing violins already, and so did Akiko-Meyers. Besides a museum exhibition, I would rather have the instrument being played than lying somewhere unused, waiting for the "right" player-a subjective value like no other-to acquire it. I mean no offense-I just believe there's nothing wrong with the news at all, nor was a "great injustice" done to your favorite performer because he/she didn't get a chance to play this one particular violin. Yes, it is great that this violin will be played again, but I am puzzled with the owner's decision. Why give this violin to someone who already has got 2 Stradivarius violins? I hope that Ms. Meyers will, in a true spirit of sharing, lend or sell one of her 2 Stradivarius violins. There are many young and promising artists that deserve a chance to get a great instrument. It was said that it's better for Anne Meyers to have the del Gesu violin than it was for the violin to be in a box on someone's shelf or some such. But if she is playing the del Gesu, then aren't there two Strads somewhere on shelves? For better or for worse, there has an emerged a kind of "ethics" about the ownership and use of the world's most desirable instruments and in that context I don't find it unreasonable to ask whether three rare violins could be managed better than to place them all in the hands of any single artist. However whether Ms. Meyers, in particular, is more or less deserving than any other, is not for me to say. I think she plays beautifully. And please spare me the accusations of petty jealousy because I am such a mediocre violinist that I could never justify owning or playing one of these rare gems regardless of my financial situation. For me to own a violin worth $100,000 would be a waste of wood. I can't help but being jealous. But that is a common feel when I hear from people who can chose between the most expensive instruments without even thinking about the money they cost. Akiko was never my favorite violinist, but she has a beautiful tone and maybe such an instrument is good for her. I don't know, I actually don't care too much, since the instrument is often too much in the middle of the discussion. Not even the sound, but the value. It seems to me that a good number of violinists I've met who have obtained wonderful instruments are ones who care deeply about playing them and who really go after such instruments. They go after them in many ways: they learn about them, they seek to borrow them, they talk with violin makers, they engage in conversations with people who also have an interest in these instruments, they find programs, they find sponsors. It seems to me that part of being an artist is also cultivating this ability to understand and evaluate fine instruments, and frankly, not everyone bothers. Anne's a great violinist- her playing is always in great taste and well executed. She has the best recorded version of Meditation from Thais, and that alone is quite an accomplishment! Whatever arrangements have been made are nobody's business but the makers, and jealousy is one of the seven deadly sins. If you care to watch the interview with Mr. Fulton on DVD "Homage", you will hear from someone who obviously knows a lot about the market that it is not that easy to buy a Stradivarius. Even if one has funds, it takes time and sheer luck for such a violin to become available, sometimes only after someone dies. I just a hope that one who appreciates those violins will understand that there is a limited number of them and release a precious one for a fellow musician. After all, that is exactly how she got the latest violin! haha, lets not get to fundamental, "Yes I am a sinner!" but actually I am not jealous at her only. I experienced a lot of instruments politics and sometimes it just makes me laugh. I tend to get sarcastic or laugh when i see something, wich I would like to change but cannot. As mentioned above, there are many great violinists who need (and with need I actually mean it) a great instrument in order to get concerts and be respected as a instrumentalist. Sometimes for getting in an orchestra you will need a certain instrument. Having 3 great instruments is good for her, but not what I would be cheering about. Good for her, thats all. As far as I am not listening too much to her recordings (although its more because of the repertoire I found of her not because I don't like her), its for me not so important what instrument she plays. Lets pronounce it this way: "I would like to give all my violins away for free to play 3 years on a fine strad, guarneri, vuillaume or something similar exquisite." Simply because you learn from good instruments what is actually possible. And no its not easy for an average violinist to get the hand on that stuff... ok I could marry rich :D, but that would be a sin in someones eyes again... (happens all the time btw) but I certainly cannot get any stipendium, win a loan or something. With 28 years and that kind of competition around. What actually is a fact is, that people auditioning for the loan of fine instruments usually already play some 100000 $ or more worth piece of wood and not having to pay their own rent or do their own laundry. I am not complaining about myself, because I am free and happy, but I wasn't always and I am sure there are people with the same illusions out there, wich I had. So I don't agree with you, Laurie, that its easy to get a fine instrument when you are not coming from a well situated family, have a good violinistical educational background before the age of 20 and the right professors around you, who are willing to help you out with their name in order to later inprint their name on you. I like what Laurie said about people who get to play/have loaned to them instruments like this. By looking at their devotion we should make time to look/question ours. I'm happy for Ms. Myers. And she makes a good point about other famous del Gesus being in museums and played only occasionally. (I tried the Kreisler once at The Library of Congress.) She's an excellent violinist, a beautiful woman and now the Vieuxtemps del Gesu will be played a good deal again in public. A choice of a violin is such a personal thing. Honestly, having tried the Molitor Strad twice, I wasn't crazy about its quality, though it's very brilliant and cutting. And Amatis are underrated as concert instruments. One of the best violins I ever tried - and I've tried 2 del Gesus and about 6 Strads - was an Amati. (See my blog here "An Auction Adventure".) I'll probably never own a Amati, Strad or del Gesu, but I feel very fortunate in owning the truly concert quality modern violins that I do have.